The National Humanities Center (NHC) has posed an excellent question to teachers: "How do you engage your students with primary source materials?" $200, cash grant to fund your project. Flip Video camera to capture your project idea. Free seminars from the National Humanities Center. Go to this link to learn more and apply today! Wall Street Journal: The Education Our Economy Needs; We lag in science, but students' historical illiteracy hurts our politics and our businesses. Go to this link to read the article and offer your comments. We lag in science, but students' historical illiteracy hurts our politics and our businesses. In the spirit of the new school year, here's a quiz for readers: In which of the following subjects is the performance of American 12th-graders the worst? a) science, b) economics, c) history, or d) math? With all the talk of America's very real weaknesses in the STEM subjects (science, technology, engineering and math), you might be surprised to learn that the answer—according to the federal government's National Assessment of Educational Progress—is neither science nor math. And despite what might be suggested by the number of underwater home loans, high-school seniors actually fare best in economics. Which leaves history as the answer, the subject in which students perform the most poorly. It's a result that puts American employers and America's freedoms in a worrisome spot. But why should a C grade in history matter to the C-suite? After all, if a leader can make the numbers, does it really matter if he or she can recite the birthdates of all the presidents? Well, it's not primarily the memorized facts that have current and former CEOs like me concerned. It's the other things that subjects like history impart: critical thinking, research skills, and the ability to communicate clearly and cogently. Such skills are certainly important for those at the top, but in today's economy they are fundamental to performance at nearly every level. A failing grade in history suggests that students are not only failing to comprehend our nation's story and that of our world, but also failing to develop skills that are crucial to employment across sectors. Having traveled in 109 countries in this global economy, I have developed a considerable appreciation for the importance of knowing a country's history and politics. The good news is that a candidate who demonstrates capabilities in critical thinking, creative problem-solving and communication has a far greater chance of being employed today than his or her counterpart without those skills. The better news is these are not skills that only a graduate education or a stint at McKinsey can confer. They are competencies that our public elementary and high schools can and should be developing through subjects like history. Far more than simply conveying the story of a country or civilization, an education in history can create critical thinkers who can digest, analyze and synthesize information and articulate their findings. These are skills needed across a broad range of subjects and disciplines. Now is a time to re-establish history's importance in American education. We need to take this opportunity to ensure that today's history teachers are teaching in a more enlightened fashion, going beyond rote memorization and requiring students to conduct original research, develop a viewpoint and defend it. If the American economy is to recover from the Great Recession—and I believe it can—it will be because of a ready supply of workers with the critical thinking, creative problem-solving, technological and communications skills needed to fuel productivity and growth. The subject of history is an important part of that foundation. SIR: -A few months since, your readers were informed that the King and Chiefs of the Hawaiian Islands were engaged in framing a Constitution for the government and also revising the laws. The Constitution has been issued from the press, and there are embraced on the same pamphlet a number of laws which many of your readers would doubtless be pleased to peruse; I have therefore commenced a translation into English, which I will continue if you think best to publish it. A considerable portion of the pamphlet consists of a revised edition of the laws relating to taxation published in June 1839. Those laws, as the public were informed in the Hawaiian Spectator, were originally drawn up, by a graduate of the Seminary at Lahainaluna, and after being revised by the chiefs were re-written by himself. The other laws were drawn up by several different persons, but all have been revised by the King and a council of those chiefs whose names are mentioned in the Constitution. The attendance however has not been universal. The Constitution, after it had been approved by the other chiefs, was sent by a messenger appointed for that object, to Gov. Adams, of Hawaii. He approved of the whole except that part which limits the powers of the Governors. The King and Chiefs who have been together, have been unanimous in the acts which they have passed. The have received many suggestions both by letter and orally, from foreign residents and visitors. They have also received suggestions in both these ways from their own subjects. The translation which I send you is a free one, not adhering strictly to the letter, as that would materially violate the English idiom. But I have attempted always to convey the sense in the clearest and most concise manner. The text of the 1840 Constitution of the then-Kingdom of Hawaii is available online. Click here to read the English and Hawaiian language versions. This day marks Constitution Day on our history calendars. 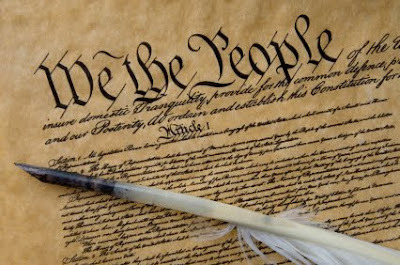 Constitution Day commemorates the formation and signing of the U.S. Constitution by thirty-nine brave men on September 17, 1787, recognizing all who, are born in the U.S. or by naturalization, have become citizens. During the coming week of September 19-23, 2011, History Education Hawaii will be sharing various online-based resources and reminders celebrating the significance of constitutional history. Teachers, history students, historians and all the history buffs will, we hope, find these materials enriching. To start us off we draw your attention to the National Constitution Center. We recommend that teachers visit this link for innovative resources and professional development opportunities. Go to this link for interactive activities specially designed for students. We also recommend the Center's Interactive Constitution at this link. This Interactive Constitution is based on The Words We Live By: Your Annotated Guide to the Constitution by Linda R. Monk (Hyperion/A Stonesong Press Book). Stay tuned for more this coming week from History Education Hawaii! A friend has recently allowed us to copy the following letter, dated March 6th, New Haven, Ct.
We were not aware as any Chinaman had ever become a student in an American College. May the success of this one induce hundreds and thousands more, to go to America for an education, and contest the palm of scholarship with the youth of the land. This week's mail brought exciting news from Colonial Williamsburg! Occasionally opportunities for professional development come across our desks that we feel will be worth your attention. History Education Hawaii hopes that you will find this offer of interest. Colonial Williamsburg's Gift to the Nation is another one of its outstanding electronic field trip. This one, entitled "A More Perfect Union" is available via complimentary access September 6-30, 2011. Take advantage of this FREE opportunity to bring this exciting, relevant program into your school or home. Go to this link today to learn more about this electronic field trip and others available today! Colonial Williamsburg's Gift to the Nation for Constitution Day offers students an opportunity to interact virtually with historical characters and provides teachers with unique resources to engage students in the study of our United States Constitution. The Electronic Field Trip, "A More Perfect Union", tells the story of the ratification of the Constitution and has as the first person narrator a young student from the late 1700s. This Electronic Field Trip builds background knowledge for educators and students, leading to better understanding of the challenges and choices made during the ratification of our Constitution.